With the WordPress Network fully enabled and configured, you see a new link in the menu at the top right of your WordPress Dashboard called My Sites. Here, you learn how to become a Network Admin and explain everything you need to know about being a Network Admin in your new WordPress Network. With the network (or multisite) feature enabled, you see the link to My Sites — if you hover your mouse pointer over that link, the Network Admin link displays in the drop-down menu on the upper-left side of the Dashboard. WordPress has separated the Network Admin menu features from the rest of the regular (Site Admin) Dashboard menu features to make it easier for you to know which part of your site you are managing. For example, if you are performing actions that maintain your main website — publishing posts or pages, creating or editing categories, and so on — you work on the regular Dashboard (Site Admin). However, if you are managing any one of the network sites, plugins, and themes for the network sites or registered users, you work in the Network Admin section of the Dashboard. Link to the Network Admin Dashboard. It is important to keep in mind the distinct difference between the Site Admin and Network Admin Dashboard, as well as subsequent menu features. 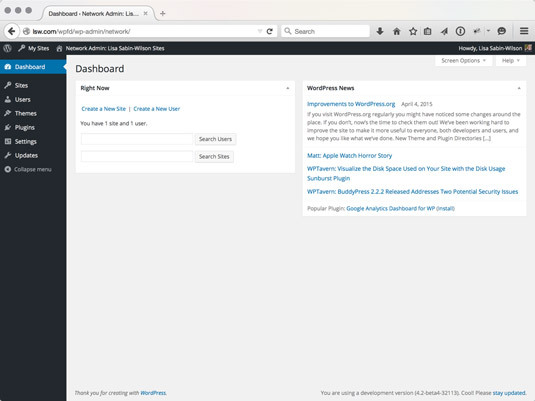 WordPress tries its best to assume which features you are attempting to work with; however, if you find yourself getting lost in the Dashboard and not finding a menu or feature that you’re used to seeing, double-check to make sure you’re working in the correct section of the Dashboard. 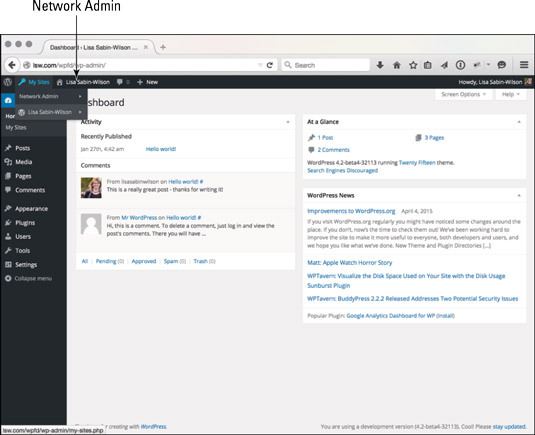 The Network Admin Dashboard looks similar to the regular WordPress Dashboard, but as you may notice, the modules shown on the Network Admin Dashboard pertain to the network of sites. Options there include letting you create a new site, create a new user, and search existing sites and users. Obviously, you won’t perform this search if you don’t have any users or sites yet. However, this function is extremely useful when you have a community of users and sites within your network. The Network Admin Dashboard is configurable, just as the regular Dashboard is, and you can move the modules around and edit the settings of the modules. The Search Users feature allows you to search usernames and user email addresses. If you search for the user Lisa, for instance, your results include any user whose username or email address contains Lisa — so you can receive multiple returns when using just one search word or phrase. The Search Sites feature returns any sites within your network that match the terms you’ve searched for. Create a New Site: Click this link to create a new site within your network. After you click the link, the Sites page appears, on which you can add a new site. Create a New User: Click this link to create a new user account within your community. After you click the link, the Users page appears, on which you can add a new user to your community. Additionally, the WordPress Network Admin page gives you a real-time count of how many sites and users you have in your network, which is nice-to-know information for any Network Admin.